What does Abbott stand for? What exactly does an Abbott government stand for? After reading Julia Gillard’s insightful and useful appraisal of what’s come before and what might come after for the Labor Party, I was reminded again, but this time more severely, exactly what Abbott’s government stands for. If you believe Paula Matthewson, if an Abbott government can deliver on the low expectations of the public by promising to do little and actually doing less, this makes Abbott a great Prime Minister. But I disagree. And it saddens me that anyone would think this way. When you look at the very core of the differences between the Labor Party and the Liberal Party, it does make perfect sense that someone like Matthewson would be happy to see a government do nothing. This is why it frustrates me so much when I hear people saying Labor and Liberal are just the same. I know the mainstream media isn’t interested in, or capable of framing the political struggle between the Labor Party and the Liberal Party in a narrative which actually explains the fundamental ideology of the parties’ policy platforms. Obviously there will always be the odd policy from both sides which confuses this overarching difference. But this doesn’t mean the difference isn’t still blatantly obvious and it doesn’t mean the difference isn’t still incredibly important. The difference is this – the Labor Party believes it is the role of the government to improve the management and support of the community through progressive policy reform. Progress. Equity. Fairness. Sustainability. In Gillard’s words: “a party of purpose”. The Liberal Party believes that the government already intervenes too much in our capitalist economy, and that the community is managed and supported by the economy, not the government. Profit. Greed. User-Pays. Privilege. A Liberal Party supporter, when true to their values, believes government ‘regulation’ is not there to serve the community’s interests; it’s there to hinder the freedom of the economy. When a voter understands these core differences and holds an opinion on these opposing values, the values should, in a sensible world, strongly influence which party they vote for. Unfortunately, we don’t live in a sensible world and these differences are muddied by the inept and corrupt reporting of politics by our mainstream media. Because of this, I think most uninformed voters don’t understand these differences at all. And I don’t think either the Labor Party or the Liberal Party have successfully communicated these values to the electorate over the last decade – though for different reasons. As Gillard points out, the Labor Party has failed to remind voters that the government policies they rely on for the success of their communities exist because of the Labor Party. Policies like Medicare, a strong public health system, a high quality public education system, a workplace relations platform which gives workers safe, fair and stable employment, disability support, nation building infrastructure, environmental protection and a strong, regulated and growing economy are all there because of the successful work of Labor governments. Labor government policies are what make our communities, and our country, such a fantastic place to live. Labor’s communication failures are caused by nothing more than mismanagement of the party and leadership failure. A bad sales pitch spoiling a great product. The Liberal Party, on the other hand, have failed to sell their ideological position to the voting public for a completely different reason. They know, deep down, they would never win power if they told voters what the Liberal Party really wanted Australia to look like. So in their case, they offer a good, or perhaps expertly misleading sales pitch, for an awful product. Middle Australia don’t want the gap between rich and poor to widen substantially. But the Liberal Party has no qualms about this outcome. Middle Australia were, judging by their response to Work Choices, wholly alarmed at the prospect of the Liberal’s industrial relations agenda. Middle Australia do expect government services and assets to be publically owned, and not part of the capitalist private sector, available to only those who can afford to pay. Middle Australia, I think, do care about equity and balance in our economy – they don’t want all the wealth and the privilege that comes with this wealth, to be distributed only to the upper-echelons of our communities. So this is why the Liberals have become experts at convincing western Sydney residents that they have their best interests at heart, when really this couldn’t be further from the truth. Abbott’s front bench didn’t come up with Work Choices, and campaign on Gina Rinehart’s side of the Mining Tax debate, because it sounded like a good idea at the time. This is what these people stand for. Not just Abbott, but every Liberal MP. It has always been very clear that the Liberal Party is very concerned with the economy. They pride themselves on being superior economic managers and this message runs through much of their rhetoric about what is wrong with Labor governments. In the last six years, while in Opposition, the Liberal Party has had to rely on the delusion that the Global Financial Crisis did not happen, in Australia anyway, to convince themselves and their supporters that it was the Labor government’s fault that the economy has been weaker than it was under the previous Howard government. But this delusion is about to come very unstuck. Because now the Liberal Party has to deliver the strong economy and the budget surplus they have been promising for the last six years in an economy which already has strong economic credentials in the form of low interest rates, low unemployment, low debt, low inflation and moderate, but impressive growth when compared with every other developed economy on earth. We already know, from the very last minute costings released by Abbott’s team in the dying days of the election campaign, that the promised surplus isn’t coming. Even with a heartless, short-sighted and gutless cut of $4.5 billion in Foreign Aid spending, the Liberal government’s budget will be in a very similar place to the previous Labor government’s deficit – as Gillard kindly pointed out – with a difference of only 0.4%. Funny how the mainstream media haven’t made much of this news. When you consider on top of this, that we know from independent Treasury figures that company tax revenue is falling at unprecedented levels, as outlined in this article by Greg Jericho, an Abbott government is going to find it extraordinarily hard to differentiate its economic credentials from the previous Labor government, without drastically cutting spending. Austerity, here we come. This might seem fine to Liberals – after all cutting government spending on services for the community, as I’ve outlined, is what they’re all about. Cutting the budget spend is often just code for their ultimate goal of smaller government. The Liberals know that those who vote for them are very happy to support the notion that most government spending is waste. And these voters are happy to support an Abbott campaign which promises to cut, slash and burn government services. Until such a time that their lives are personally affected by these cuts. When their child’s class at school suddenly has 30 students per teacher, instead of 20. When they have to wait 12 hours in the emergency room at their local hospital, because there are no nurses or doctors available to see them. I always think of Liberal voters as those who decry paying for insurance, until the day their uninsured house burns down. 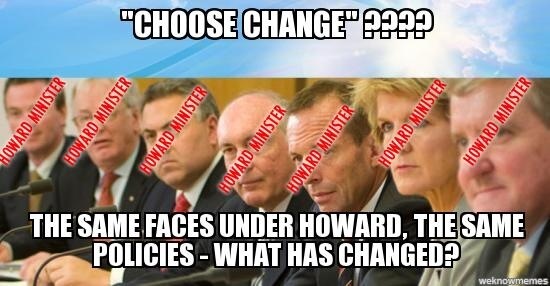 How will Abbott organise his austerity regime so it only affects Labor voters? I don’t think this is possible. Anyone seen the state of David Cameron’s austerity economy in the UK lately? Has Abbott caught up on the news that the pro-austerity spread sheet contained a fatal mistake? So what does Abbott stand for? He stands for ‘no’. He stands for ‘backwards’. He stands for ‘repeal’. He stands for undoing Labor’s progressive policies, which he has successfully misrepresented as failures. The Carbon Price. A National Broadband Network for all Australians. A Mining Tax that shares the wealth of our nation’s resources with everyone, not just the rich. He’ll keep Labor’s policies that he knows the voters won’t let him touch in the short-term, such as the National Disability Insurance Scheme and the Gonski School Funding plan. However, as Gillard says, it’s important for Labor to remind voters, and to remind them again when they don’t listen, that these reforms were Labor’s doing. While Abbott might get a short term glow from killing Labor’s progressive policies which he has painted as waste, and keeping Labor’s policies that he’s too scared to touch, at the end of the day, what does he really stand for? And what comes next after his wrecking ball hangs idle? It’s wrong for people to say Abbott stands for nothing. It’s blindly obvious what he and his Liberal colleagues stand for, whether they’re willing to admit it or not. The next three years are Labor’s opportunity to remind voters exactly what they voted for in an Abbott government, and what will happen to their communities because of this. I say bring it on. are to be lost in the wilderness for at least two terms. Further you should not underestimate Tony Abbott’s ability to be a sound administrator and that he is very different from the caricature that the ALP and others from the left have tried to insist is the reality. I agree with you that there is a difference between the Liberal and Labor in terms of their approach and that the former want to minimise the intrusion of the state into the lives of the people. Frankly I think that there is something rather unnatural in the ALP’s desire to constantly try to engineer the nature of our society and more often than not they end up making biog changes that are not a benefit and cost heaps to fix. Iain. An good example of a society where social engineering (progressive improvements on behalf of the greatest number of citizens) is the current USA. Look what is missing from the ‘free from social engineering’ society. Health Care (only for those able to afford a strict time-limitted private insurance). No PBS! You pay the price for medicines that the drug companies wish to charge. People are constantly searching for herbal alternatives (they’re cheaper!) If you break an arm or a leg, you could finish up loosing your home and find yourself living on the streets. Social security: food stamps and charities for you. Just a small sample of the difference between ‘the best country in the world’ slogans you hear so frequently, and Australia. Which country would you choose to live in if you were to choose? I think that the US experience is far from perfect and that you are mistaken to think that is what I am advocating. The trick is to find a way for governments to have the lightest possible hand on the levers of power while maintaining beneficial social constructs that can make the lives of all citizens better. Thus any suggestion that an Abbott government would even contemplate the dismantling of our institutions like Medicare or the PBS is just silly Labor party scare tactics. Tony Abbott will never be able to stop those boats from coming from Indonesia. Fact of law. When the people find that they can no longer use asylum conventions to get an immigration outcome they won’t be so keen to pay people smugglers. Invoking “facts of law” is an absolute nonsense because such so called “laws” are unenforceable therefore void. Mr Hall! Best you have a read of the outcome of the Hirsi Jamaa and others legal contest against Italy held in the European Court of Human Rights, 23 February 2012, maybe of interest to you Mr Hall on just what could happen if that legal contest is taken against Australia by other parties. The ruling was against Italy’s actions by towing the boats back to Libya. Just to add insult to your argument Mr Hall, is the ruling by the Australian High Court of Australia regarding the Malaysian Solution, became the legal question based on the Facts Of Law delivered by our high court justices regarding the contents contained in the 1951 Generva Convention Status of Refugees and the 1982 Untied Nations Convention on the Law of the Sea that bonds the argument held up in the Hirsi case by the Australian High Cout. It is clear that slogans work – as Tony Abbott has proved over the past 3 years. It is also clear, if you have a shot at it, that negative policy lends itself beautifully to 3 word slogans, whereas good policy requires a few more select words. Tricky! During the recent campaign I cringed many times listening to Labor politicians trying to sell their policies and credentials with a barrage of words and explanations. Let’s face it, voters have to be wooed with verbal simplicity. That is probably the only useful thing we will ever learn from Tony Abbott. After saying all that, I do not have the answers. Sorry! “Labor government policies are what make our communities, and our country, such a fantastic place to live…. A bad sales pitch spoiling a great product.” Thank you again Victoria. Education is the key! In the final years of schooling, a strong emphasis must be placed on teaching the BENEFITS OF TAXATION – where our taxes really go to & how our community is improved by spending our taxes on worthwhile social supports such as Medicare & Disability Care. The current emphasis: TAX IS BAD – WE SHOULD NOT PAY TAX – is a selfish, unrealistic concept when we also demand huge social support & safety nets & increasingly more advanced services from Government. Students should also be led to consider the differences between our country & those less fortunate… where medical care & social supports are minimal or non-existent; where there is no clean water; roads are pitiful… & then be asked to honestly contemplate which they would prefer! POSITIVE, SPECIFIC TAXATION-EDUCATION would engender a sense of pride & gratitude that we are so fortunate & it would translate into a workforce with a very different attitude from many in the present generation who seek to exploit our nation & its resources but resent returning a fair share of profit back to the community. A well informed taxpayer will happily contribute to a society that provides outstanding services & supports…. Australia the envy of the world… & will appreciate that his/her own income & lifestyle is directly connected with the overall wellbeing & prosperity of the community. Furthermore, a willing taxpayer is more likely to support initiatives designed to collect taxes from those who would try to avoid paying their fair share (e.g. super profits taxes) & would also more willingly vote for distribution of community wealth in medical, dental, aged care etc. schemes and fight to protect those hard-won safety nets from raiders & exploiters. TAXATION-EDUCATION would help students to value those things in society which contribute to our collective health & well-being & to recognise that income is not the only criterion of wealth; that even tax collected from a small income helps to provide enormous services & infrastructure from which we all benefit. Had Australian voters been properly educated to recognise our good fortune, they would not have taken so much for granted & would not so easily have been hoodwinked into believing they are badly off. Negative tactics are far less effective when we develop a sense of gratitude for the social supports we have access to & pride in our own contribution to them.